The Scot scooped the 115,000 pound title and succeeded Taylor as champion with a resilient display against the plucky Austrian, who led 9-7 at one stage. Missed doubles in four successive legs allowed Anderson to seize control, and the two-time World Champion held his nerve during a nerve-shattering finale to close out victory in the longest-ever Blackpool final. 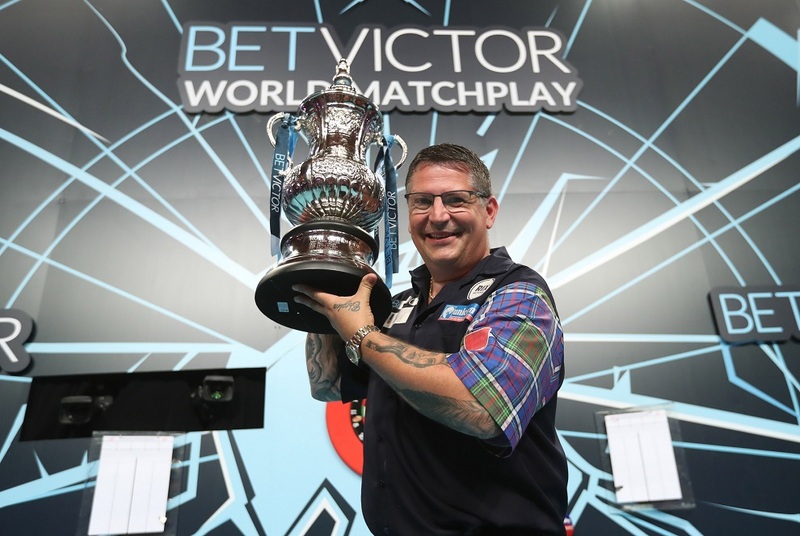 Anderson had also landed a brilliant nine-dart finish during his quarter-final win over Joe Cullen, and added to March's UK Open triumph with another big title in his tenth World Matchplay appearance. "I'm delighted to win this magnificent tournament," said Anderson. "It was a struggle to win, as it always is against Mensur, and I think I rode my luck a bit tonight. "When the bullseye to win it bounced out it was frustrating but I managed to regain my composure to win it. "It's been nice to see Phil back in Blackpool this week and the crowd have been fantastic. This is a special place for me now and I'll look forward to coming back here next year to defend my title." A high-quality final saw Suljovic lead 1-0 and 2-1 only for Anderson to land six perfect darts in moving 3-2 up. 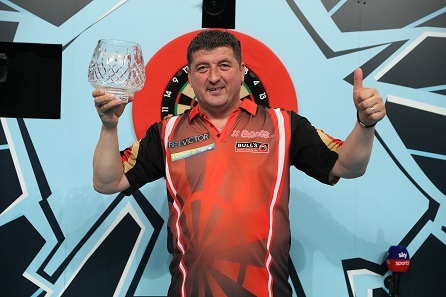 Suljovic posted a pair of 14-darters to regain the edge, before Anderson finished 68 and 84 as he moved ahead 5-4. An 11-darter saw the Champions League of Darts winner level before he led once more, and Suljovic opened up the first two-leg lead of the final at 9-7 with the aid of a 118 checkout and another 14-darter. Anderson, though, capitalised on misses from the Austrian in the next four legs as he moved 11-9 up, before extending that advantage to 14-10 despite an 11-dart leg from his opponent. Suljovic pulled back to 15-13, but Anderson crucially took out 105 and 77 to regain breathing space as he moved to the brink of glory at 17-13. The Austrian hit back once again to save the game, with five straight legs putting him 18-17 up as a capacity Winter Gardens crowd held its breath. Anderson regained his composure to move 19-18 up, but saw a dart at the bull for the title bounce out as Suljovic kept his hopes alive, only for the Scot to claim the next two legs and seal glory on double ten. Suljovic took home £55,000 as runner-up following a fine week in Blackpool, and said: "It was a brilliant feeling to play in this final - it was such a good game. "Thank you to everybody for the support, I loved playing here. "Gary played brilliant, he was the best player in the tournament so it is OK to lose to him - he is a champion and I respect him."